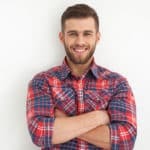 If you are reading this review, then it is likely that you have ever found yourself stuck on a rocky climb, muddy terrain, deep snow, a sandy hill or whatever obstacle. You probably didn’t have a winch, and if you did, then it may not have been good enough for the job. Human strength may not have been enough to get you out of the predicament. Now that can be frustrating. But, don’t fret, we have a solution. We want to introduce you to Harbor Freight Badland winches which are some of the best winches in the market. A winch is a heavy-duty device fixed on a truck for lifting, towing or hauling. Harbor Freight winches are designed to produce a powerful torque that can easily pull a vehicle that weighs several tons. These tools are manufactured in Calabasas, California and are sold throughout the world. Read on and find out what more the badland winch has to offer. 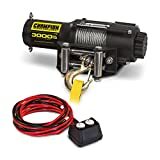 This beast of a winch is a high quality and affordable winch perfect for off-road vehicles (Trucks and SUVs). The Badland winch has an overall ergonomic design with high-quality parts that offer topnotch performance. It is equipped with a three-stage planetary gear system that delivers fast line speed and smooth, consistent power. It also has a free-spooling feature for a fast line-out. 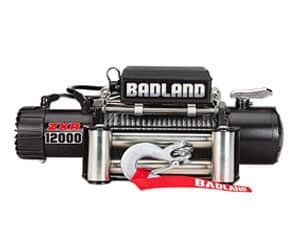 The Badland winch features a 6 HP series-wound motor that remains cool even during a long winch pulls. An automatic load-hold braking system prevents the motor from overheating when there is an upsurge in pulling temperature. It can pull up to 12,000 pounds which makes it stand out from other winches in the same price category. The Badland winch is also specially designed with an aircraft –grade cable that will pull an SUV stuck up a hill without breaking. The Badland is a water-resistant model, and the metal parts are resistant to rust. The overall performance of the winch never wavers even in bad weather. It is durable, reliable and highly efficient. You are going to get a long life from this product so long as you follow the instructions on the user manual. It also equipped an assortment of safety features, that is, an automatic load-holding brake that immediately stops the pull when there is a safety issue. For overload protection, it is built with an In-line circuit breaker. The manufacturers also made a handheld remote for this baby to keep you at a safe distance when operating the winch. This model comes with a universal remote that offers convenience when operating the winch. The installation of the Badland winch couldn’t get any easier. First, mount the fairlead then attach the controller box followed by the winch via the front bumper plate. Confirm that the cable passes through the fairlead and finally wire the battery to it. That’s it. Get in touch with a professional if you find the process confusing or follow the instructions on the manual. The Badland winch is strong enough to handle pulling big trucks. Installing it is easy if you can handle carrying about 90 pounds and is a professional product which you can get when you are on a budget. The fact that an extended warranty backs it gives you peace of mind when purchasing it. But that shouldn’t be an issue since it’s made of high-quality material that will provide you with many years of excellent performance. It wouldn’t be a proper review if we didn’t throw in something extra for you to consider. We bet that you have heard of Warn industries or at least seen their products stacked in several auto dealer shops. Hard not to when the company has a legion of customers in 65 countries on six continents thereby making it one of the biggest brands in manufacturing vehicle performance enhancing equipment. Warn products are known for their unique design features and excellent products intended to improve the performance of 4WD vehicles, utility vehicles, and ATVs. Warn Industries is based in Clackamas Oregon and their industrial unit markets hydraulic and electric winches and hoists to commercial, industrial and duty customers in the world over. The company prides itself in its state of the art line of winches and hoists built for every DIYer and professional trade workers. Here’s a look into one of their products. The VR8 is the first in the Warn VR series winches and represents the Warn reliability and upgraded performance that you can rely on. The VR8 provides the fastest no-load line speed in the VR series and is very easy to install. It has a pre-set pulling capacity of 8000 pounds with the help of a rotating ring gear free-spooling clutch. It features a three-stage planetary gear system that is smooth, durable and reliable enough to pull you out of any jam. Its brake is specially designed to offer unparalleled winch control no matter the circumstance you are operating in. The unique feature invested in this winch lies in its tactical look that allows both an upright and a low profile mounting configuration. The powder coat over primer undercoating finish gives the winch resistance to rust, and the coat doesn’t chip. The general look of the winch is aesthetically appealing and entails a strong build thereby guaranteeing it a long life. 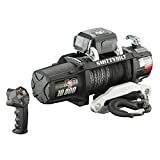 It also features a waterproof Albright contactor for excellent winch control meaning that it maintains its performance level no matter what weather condition Mother Nature may hit you with. It also has an awe-inspiring cone break which can hold the full rated winch load. The Warn 96800 VR8 winch maintains its enthusiasm in mud trails, rocks, and off-road terrains. It’s pretty easy to install even on tailor-made bumpers. It has excellent torque, and the company provides both synthetic and steel ropes for convenience sake. The winch and hawse fit perfectly together and are perfect for anyone in dire need of a winch for an emergency recovery situation. Do Harbor Freight have a lifetime warranty? Is Harbor Freight and American Company? Who is the owner of Harbor Freight? Where is WARN Winch made? What is the difference between a synthetic line and steel cable winch? 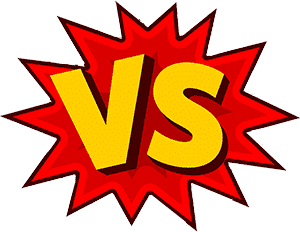 What is the difference between an electric and hydraulic winch? Some Harbor Freight hand tools are covered by a lifetime warranty. You will get a replacement in case the tool is found to be defective as a result of poor workmanship. Harbor Freight also reserves the right to give you a substitute replacement tool in case the identical item isn’t available. The warranty is only applicable to the original purchases of the product and is nontransferable. You are allowed to exchange the defective item at any other store other than the one which it was initially purchased. The buyer has the right to return the merchandise for a full money back guarantee within 90 days of the original purchase. Debit card and check purchases may also be returned in cash. Yes, it is an All American Company. Its tools are also gussied up with brands like ‘Chicago Electric’ to indicate that they are American made. It has its headquarters in Calabasas, California and operates a chain of retail stores, ecommerce, and mail-order businesses. They have over 17,000 employees in the United States with 800 stores stretching ought throughout 47 states. Where is Harbor Freight manufactured? Since it’s an American made company, its manufacturing plants are also located at the headquarters, that is, Calabasas, California. Harbor Freight was founded by Allan Smidt who passed the button of ownership to his son Eric Smidt. Eric Smidt is now the CEO and chairman of Harbor Freight Tools. The incredible Winch is made in Clackamas, Oregon. They have a 180,000 sq. Ft. Manufacturing facility that doubles as an engineering facility and also has office spaces. Most of Warn industries Inc. tools like industrial and military hoists, industrial winches and ATV winches are the United States made. Arthur and Sadie Warn founded the Warn Industries in 1948. The business started as a door-to-door sales business in Seattle but then grew into a booming business and an OE supplier to leading companies like Nissan, Chrysler, Ford, SsangYong, Kia and GM among others. Steel cables, also known as wire ropes are made up of strands of carbon steel wire. Steel cables are the most traditional forms of winch cables, and most winches come fitted with these steel cables since they are flexible and cheap to produce. What’s more is they are highly resistant to heat and abrasion. The only disadvantage of the steel cables is that they are heavy and can crush easily if wrongly re-spooled. This inconvenience is what necessitated the invention of synthetic lines. A synthetic line, on the other hand, is a new invention in the winch industry, and they are made to be stronger than the traditional wire ropes. They also are lighter in comparison but maintain their rigidity regardless. Synthetic lines can withstand more tension than wire ropes. Most winch manufacturers give you an extra synthetic rope when you buy their winch so you can sample out both options. The difference lies in their work cycle. An electric winch offers maximum spooling power when the engine is dead. But it can only run for 5 minutes in that situation. Electric winches utilize permanent magnet (PM) motors and series wound (SW) motors. SW motors are robust, and that is why they are ideal for off-road adventure vehicles. In contrast, a hydraulic winch can spool continuously for as long as the engine is running. That is why they are perfect for ranching and farming. 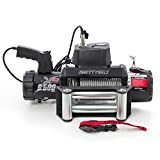 Which is the best winch for my truck? Choosing the best winch largely depends on how well the features fit into your truck and the intended use. Consider going for winches that have longer rope length for further reach, gear trains for performance optimization and a series wound motor which produces about 15% more amps in comparison to a permanent magnet. If you are looking for a high-quality product that can be found at a reasonable price, then consider going for the Badland winches. The Badland winch is built for safety, has exceptional features and is backed by a lifetime warranty by the manufacturer. 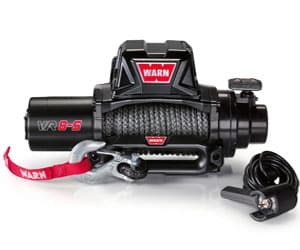 The Warn winch albeit being a bit pricey is also a high-performance winch, consists of a strong winch and offers both low profile and upright mounting applications. Our review shows that Harbor freight winches are built for excellence and you will not be throwing your money away when you buy the Badland 12,000 lbs. Winch. If you are still undecided, then weigh the pros and cons of purchasing a winch. You probably want to say goodbye to the days of risking your safety and comfort by waiting for a tow truck that may take hours to come. Not to mention the high service charges that you may incur. The power is now in your hands.